We had a fabulous December 25th. We hope that it was a good day for you as well, gentle reader. Santa came! Elise is a devoted Santa fan, and for the past several weeks every story and game has featured the big guy in one way or another. The wonder and excitement of having some magical stranger invade one’s home and leave gifts is apparently very well-suited to the three year old brain. Elise decorated cookies to leave for Santa, and chose the ones she figured he’d like most. (The ones with chocolate sprinkles.) She counted baby carrots for each of the nine reindeer and named them by name. (Apologies to those of you who may be offended that we fed reindeer “the veal of the vegetable world.”) Elise carried the tray soooo carefully and so sweetly. It was the first thing she checked in the morning, too. 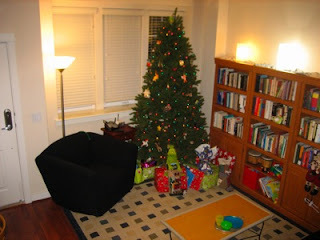 Santa was exceptionally good to everyone here. While he didn’t bring the dog on a leash for Elise, he did bring her a Mavis engine. He brought Andy “shaving stuff” and brought Heather cleaning supplies in the form of a robotic vacuum. As it happens, Elise’s predictions were entirely accurate, and we’re all scratching our heads because there was no way she could have known! At least for now, Elise likes to open each gift and play with it a bit before bellowing out “thank you!!!! !” to the person who gave it to her. So, grandmas and grandpas, if you heard something Xmas morning, it was probably a very appreciative little girl. We have more pictures and some movie footage, but those won’t be up for awhile. (Rumor has it that everyone’s too busy watching the robot vacuum the floor to muck with the video camera.) We’re looking forward to hearing how you spent your holiday-drop us a line! Share some pictures! It’s strange to be sooo far from friends and family this time of year (and to not need jackets outside), so we’re counting on the wonders of technology to bring us closer. Merry Christmas!